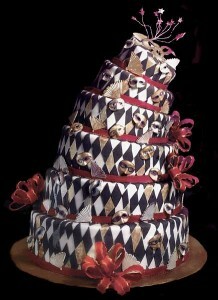 Thanks for visiting the Art Of The Cake blog! Please check here for announcements and current information on courses. Classes are offered to pastry professionals, cake decorators, and amateur lovers of cake decorating and gum paste. Learn to make all the flowers necessary for your wedding cake needs, including roses, stephanotis, sweet peas, apple blossoms, pansies calla lilies, Casablanca or Stargazer lilies, ivy and all the appropriate leaves to make the flowers look more realistic. Classes for some of the more intricate flowers such as peonies, poppies, iris and orchids are also available. These classes will teach you the skills necessary to create spectacular showpieces made of chocolate or sugar. You will learn how to use poured, blown, bubble and rock sugar. You will also learn how to temper chocolate and create wonderful edible chocolate centerpieces. Private Lessons tailored to your individual needs are also available. You are currently browsing the Art Of The Cake blog archives for July, 2010.